Ingredients (Banana Mango, other flavours are slightly different): Skimmed Milk Powder, Maltodextrin (Glucose Polymers 28%), Fructose (19%), L-Glutamine (6%), Whey Protein Isolate (4%), D-Ribose (3%), Thickener (Tara Gum), Natural Flavours (1%), Vitamin & Mineral Mix (0.1%) TORQ's unique matrix of Glucose Polymers, Fructose and Whey Protein Isolate stimulate the rapid absorption of carbohydrate to re-stock vital glycogen stores. TORQ's active ingredients, D-Ribose, HMB, L-Glutamine and blend of carefully selected vitamins and minerals work together to repair and recharge over-stressed muscle fibres. Torq uses a Maltodextrin:Fructose mix which allows your body to absorb 40% more carbohydrate than usual at up to 90 grams an hour! We believe TORQ recovery to be the most thorough and effective formulation of its kind on the market today - yet we flavour it NATURALLY and use no colours or artificial sweeteners. There is not a single ingredient within TORQ recovery's formulation that isn't derived from a NATURAL source, or doesn't naturally-occur within the human body. It is generally accepted that consuming carbohydrate and protein at a 3:1 ratio within 15 minutes of finishing exercise will speed up glycogen synthesis (numerous authors have confirmed this). In other words, it will help you to store carbohydrate more effectively than consuming carbohydrate alone and/or waiting until this 15-minute window of opportunity has passed. It is also generally accepted that whey protein is faster acting and available more quickly than any other kind of protein, thus it provides the amino acids necessary for muscle repair with little delay. TORQ recovery represents this 3:1 blend of carbohydrate and high quality whey protein. It is TORQ's unique blend of D-Ribose, HMB, L-Glutamine, vitamins and minerals that sets it apart from other recovery products on the market. D-Ribose and HMB are particularly expensive ingredients and it is not unusual for nutrition companies to claim that their products contain these components, whilst providing too small a dose to have a significant effect. Most other products don't contain them at all. We do not believe in compromise, so every serving of TORQ recovery contains a dose of D-Ribose, HMB and L-Glutamine that has been verified by the available research. TORQ Recovery should be consumed within 15 minutes of finishing any exercise session of significance (prolonged or intense training). Its role is to replenish degraded carbohydrate (glycogen) stores, repair muscle tissue and re-charge cellular energy levels. TORQ Recovery Plus+ Consume 2 X per day during periods of very intense training. TORQ Recovery Plus+ contains potent natural supplemental nutrients that help the muscles to produce power and recover more quickly when training is particularly heavy and intense. This product does not replace TORQ Recovery, it’s a supplement to it and should not be used unless training/racing frequency is particularly high. TORQ Energy Natural Organic Consume 2, 4 and 6 hours post exercise at times of high training stress. TORQ Energy Natural Organic is a pure carbohydrate glucose polymer, often dubbed the invisible calorie’. Regular consumption of this product during the hours following an exercise session (even if added to food) will further aid the replenishment of glycogen stores at times of high physiological load. 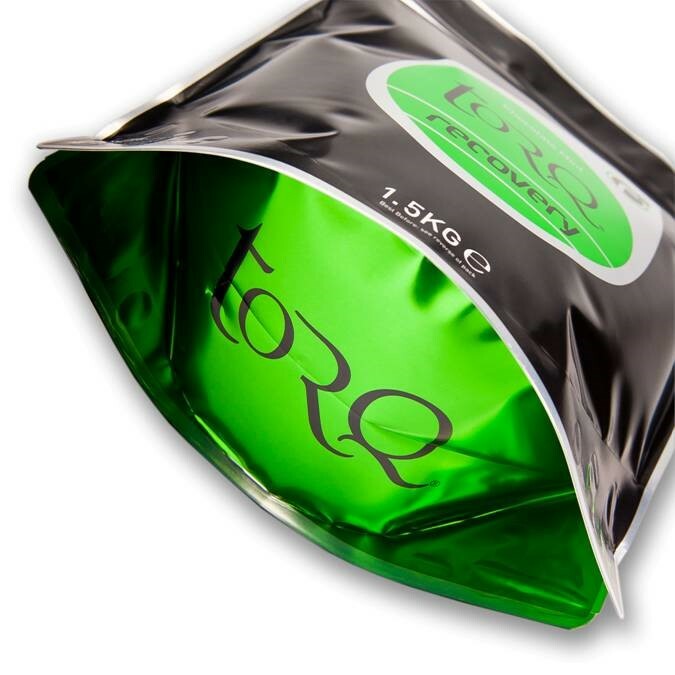 Torq Recovery Drink 1.5kg Pouch is rated 4.3 out of 5 by 116. Rated 5 out of 5 by AndrejRopret from Great product Very good taste and better recovery than any other product in the market. Rated 5 out of 5 by MuffinG from What a flavour Who knows how well this works, but I trust that it is as good as its rivals. However, the flavour is amazing and it mixes up really easily with no lumps, etc left in the bottle. I therefore give a great thumbs up.